More than 540,000 Minnesotans make their homes in Ramsey County. 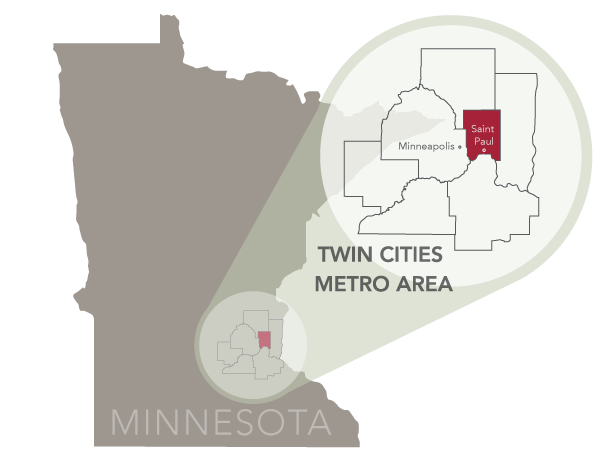 Located in the heart of the seven-county Twin Cities metropolitan area, it is the second-most populous county in Minnesota with about 10 percent of the state’s residents. Ramsey County was established on October 27, 1849, one of the original counties of the Minnesota Territory. Predominantly urban, Ramsey is Minnesota’s smallest and most densely populated county, spanning 170 square miles. Ramsey County communities are nationally known as attractive, livable places rich in history, diversity and opportunity. Ramsey County includes all or part of the following cities: Saint Paul (the state capital and county seat), Arden Hills, Blaine, Falcon Heights, Gem Lake, Lauderdale, Little Canada, Maplewood, Mounds View, New Brighton, North Oaks, North Saint Paul, Roseville, Saint Anthony, Shoreview, Spring Lake Park, Vadnais Heights, White Bear Lake, and White Bear Township. Maintaining more than 6,500 acres of parks and recreational facilities, including 14 parks, four golf courses and 11 ice arenas. Connecting residents to assistance and support programs. Providing law enforcement and public safety and legal services. Registering voters and managing elections. Operating recycling and yard waste facilities. Managing a library system with seven locations. Operating an emergency call center (911). Processing birth records and marriage licenses. Maintaining and improving county roads, bridges and related infrastructure. Planning and developing public transportation services. Inspecting food establishments and vendors. Supporting an active workforce through job readiness services. Responding to natural disasters and public health emergencies. Ramsey County is committed to ensuring that our services and this website are accessible to people of all backgrounds. To navigate this website in a different language, consider using Google Translate or Bing Translator. Ramsey County also provides a telephone interpretation service in 170 languages. The service is available by calling 651-266-8500 - the receptionist will work with you to connect with staff from any area in the county and a translator to assist you. EZ Info 651-266-3800 is an automated phone line that provides information specifically about financial assistance programs in English, Spanish, Hmong and Somali. Interact with state eligibility systems to give up-to-date information about a case status. Leave messages for your workers and report changes. Several videos and publications are available in Spanish, Hmong and Somali.